For the next 50 years, the history of the Arabian Peninsula is dominated by the tall, commanding figure of one man, Abdul Aziz bin Abdul Rahman Al Saud, more popularly known as Ibn Saud. By force of arms, by the power of his personality and with the will of God, Ibn Saud conquered and united a vast desert land where for centuries tribal leaders had fought each other for the spoils of war and imperial powers had vied with each other for influence. 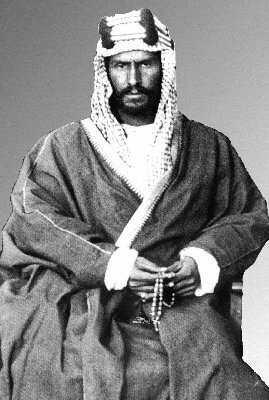 The Kingdom that Ibn Saud forged, a Kingdom the size of Western Europe, reflected the character of its founder. A devout Muslim, Ibn Saud followed in the footsteps of his forbear, Muhammad bin Saud, in basing his conquest and his rule on strict adherence to Islam. He laid the foundations for a state that would play a crucial role in the politics and the economy of the Middle East in the 20th century, and that would exert a considerable influence on the world’s stage. And, while he built his Kingdom, he ensured that the foundations he laid were deep and secure in the faith that had been born in the land he ruled. Amongst the more positive stereotypes of the Arab in Western minds, there is the romantic image of the Arab warrior, mounted on horse or camel, surviving all the challenges and hardships of desert life, true to himself and his God. As the events in the life of Ibn Saud unfold in this information resource, it will become evident that, on this occasion, the image scarcely does justice to the man.